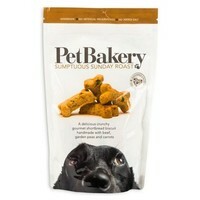 Pet Bakery Sumptuous Sunday Roast Dog Treats are delicious crunchy gourmet shortbread biscuits made with beef, garden peas and carrots. Made with only top-quality ingredients, Pet Bakery offer the perfect treat for your dog that can be given as a treat or as a reward for good behaviour. Flour, Margarine, Beef 16%, Carrots 3%, Peas 2%, Dextrose, Minerals, Rosemary Extract.